Which keywords will improve your product SEO this holiday? According to Google Shopping data, only 1 in 10 smartphone users are certain about the specific brand they want to buy when they first begin looking for information online. The same study found that 2/3 of smartphone users agree that when conducting a search on their smartphones, they look for the most relevant information regardless of brand. These stats suggest consumers are less loyal to brands and more loyal to relevant information that they can discover at their time of need. To compete in this digital landscape, even the most established brands have to focus on delivering relevant information in context for every shopper. 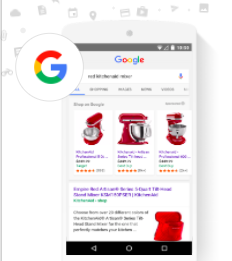 Google is how many shoppers discover, research, and buy products -- whether typing or speaking to their computer screen or mobile phone. Google’s own research has shown increases in discoverability and traffic for those products and brands that take advantage of enhanced and modified product attributes in their shopping feed. Puja Chokshi and Anand Vora of Google Shopping Partnerships will discuss how brands can compete on the next-generation of digital shopping experiences in an upcoming webinar: How to Build Your Brand and Your Business with Google Shopping.